Let me explain a bit on the “European-worldwide” style of racing. The Naviga has four classes in the FSR Offshore; 3,5 -7,5 – 15 and 35cc. Boats need to have a surface piercing prop and the run on an oval course. Heats are 8 minutes with 2 min of prep-mill time. They run four heats, the three best results count and the pilot with the most laps qualifies for the finals. Finals are 12 minutes with 2 min prep-mill time. Naviga also organizes the popular FSR-V classes. They run 20 minute heats, have sub-surface props and run anti-clockwise on an M-shaped course. In the beginning of the Offshore class the boats needed to be resembling a real offshore race boat. Including window and/or cockpit with drivers. Nowadays that requirement has vanished, resulting in more purpose built style boats. They are not getting any better looking because of that. Race boats can look good and they should IMO. Due to some Dutch success in the 2008 World Championships in Leno Italy, Dutch competitor Thomas G. took 4thplace in the 35 Offshore class, we were allowed to enter four (instead of the usual three) competitors in that particular class. Looking at the World cup leading boats a standard 45 inch boat would not cut the mustard if I was to be competitive. The lead boats measure up to 70 inches with big powerful 35cc engines from CMB, Mathe and SG. I looked on Youtube for vids of the Leno 2008 finals and studied the conditions over and over again. The wake these boats churn up just eat up a 45 inch boat. You can tag along on the outside but no way you can compete. As I did not have the funds to buy such a 35cc engine (up to 1800 dollars for just the engine) I looked for a bigger boat that I could power with a regular high mod Zenoah engine of some sort and still have enough speed and that could handle the big boats wake. No commercially available 50inch plus hull could tempt me. It either handled bad, would not perform with a 26cc engine or was just plain ugly. I wanted something that would perform with an affordable 26cc engine, would corner well and looked nice. At the end I could lay my hands on an old hull that had enough deadrise to be a good base. I tried and tested the bare hull, made alterations because I was not pleased with the performance. I altered the keel (get the rocker out of it, sharpen it up), altered the strakes, stern section, cut it up to 55 inches, get some hook in it on the outside, etc. Eventually I had something to work with. I designed a new deck and cowl and finally could make the plugs and molds for it. I never made molds before so I informed myself thoroughly on what was available on the internet. It was a huge amount of work, more than I expected. After the first plug on-water testing in January 2010, i could produce prototype hull#1 mid May 2010. 4-5 months of hard work. As I knew that the hull itself now was good, I could test the hull, deck and cowl as a whole. First outing was on a lake nearby. All looked well. As a power plant I mounted the M&D Cast engine, a 26cc powerhouse. But running by yourself in no way resembles race conditions in full heat racing. Time to do some serious test work. For the start of the Dutch championship in June I was too late to designate the Lancer 55 (as I now call it) as my number #1 boat, so used my trusty AC Razor 45 which served me well before. It usually takes some serious time and testing before I am happy with a setup. Not until the second race the Lancer was ready to enter a race. I needed to make “race-minutes” to get the feel for the boat, the trim and to get the kinks out of it. Furthermore I was still working on a v-shaped epoxy fueltank (which by the way is still not ready) and some other stuff. On the race course I could not yet find the speed and handling that I liked to have in race conditions. I switched the rudder extension and did some more prop testing and I was finally getting where I wanted. During heats I switched boats so I could get some results and test time at the same time. By now the 27th of July is getting near. Time to get ready for the World Championships in Hungary. I made an extra cowl with more ventilation holes because I knew from studying the conditions, it would get well over 90 Fahrenheit. I also put in a larger tank (32oz/920 cc) for when I would reach the finals (12 minutes of runtime). My ultimate goal was to qualify for the 12 minute final. I teamed up with my pitman Paul Wijnstra (and his girlfriend) to drive to Oroshaza in Hungary. Paul was competing in the 7,5 and 15cc hydro class. It was about a 14 hours drive to reach the small town of Oroshaza. The venue was held next the the town at the local spa-resort Gyopárosfürdő (yes, you need to read it five times and pronouncing is even harder). There was a campsite, lots of swimming pools and food and drink stands. You could even get a massage. We would not get bored! We put up our tents and gradually the Dutch team for the Offshore and Hydro classed was getting complete. Registration and surveying the boats and transmitters is done by the Naviga judges. A good thing I guess. Safety first (for competitors and spectators). We had two days of open water and there was also a test lake nearby if you wanted to have more privacy. I must say the Hungarian power boaters did a very good job through the whole venue. As soon as open water was available me and the other guys of the Dutch team found ourselves at the pond for some testing. In the offshore class my other Dutch team mates; Sander Wolfs was running a Faluga (62 inch Norwegian hull) with a custom Mathe 35cc engine, Kees Zwartbol with a Sigma 51 with CC Pro-mod Zenoah and Bernard Wiek with Lancer prototype hull#2 of the Lancer (I laminated that for him to compete as he could not get his designated hull run right). Bernard did an amazing job in two weeks time to fit it, set it up and compete at such a high level. Well finally I was there; I found myself on the driver stand next to the “big guns” I read about all those years before. Bjon Hofsten from Sweden, Mauro Bragheri, Allesandro Oldini and Valter Seljak from Italy, Costa from France, Odd Eric Kanth Lundem and Trond Nilsen from Norway etc etc. A bit intimidated and nervous I threw my boat in and made some laps. She performed well. I gave it a little more down trim and Paul and I knew that I could not prep me or my boat any further. Some guys do so much testing, they wreck their boat in open water and are repairing the whole venue in order to compete. Kees Z. had to do some adjustments on his cowl and exhaust and Bernard followed the setup i had. Sander was good to go. On the second day I prepped my Razor (as a backup boat). After opening ceremony where all the competitors from all countries marched through the town (with flags and marching band) to the local town hall where the official opening took place. Over three hundred pilots, some with family from over thirty countries. There were competitors from Russia, USA (All Hobs), all over Europe, China, Hong Kong, Asia, New Zeeland, etc etc. Afterwards we ate and drank some and went to bed. Now the real racing would start! The venue started with the smaller 3,5 cc Offshore boats, gradually building up to the bigger classes and the hydros. Finally after a couple of days it was our turn. Everybody gathers at the pits just behind the spectator stand so you could follow the races very closely. A couple of electronic scoreboards keep you informed really well about the standings. Results were printed out and put up for everybody to read. Just behind the driver stand you have the prep-area. We called it the “highway to hell” and hummed the known AC/DC song as we entered it. It was very hot in there (covered in plastic sheeting) but you set your boat and toolbox down and peeked around it so you could see the heat that was running. After that heat was done, the judges gave us the signal to come on to the driver stand. Wind was picking up and that was nice to get some of the heat of the driver stand. In the first heat, three of the four Dutch pilots competed together. So that was “easy”. Going safe and finish was the strategy to go. No use in wrecking your chances in the first outing. You have to finish to finish first! Through the heats some competitors with big boats had trouble negotiating the turns and they kept “falling of the pipe” so they could not get their laps in. Also the water was quite rough and the smaller boats had trouble staying right side up. Some of the bigger boats even blew off the water due to wind and wake conditions. Setup was everything. Bernard had some trouble with his engine setup. His M&D Cast did not perform that well due to a fouled up carburetor (as we found out later on). Kees Z. blew off the water in his heat number 2 due to a big branch that floated just below the waterline. It took out three other boats in that heat. No major damage on his Sigma, it just put a dent in his rudder and ego…. After three heats (with a steady 26 laps in every heat) I let it rip in the last heat with 29 laps as result. I was in the finals! In heat 3 Bernard finally got into his stride with 26 laps though he was running quite loose (we had changed the carb but could not test the final adjustments). In his final heat I told him to run a more tight setup as the water was churned up pretty bad in my heat (I ran just before him, with 2 big boats). He was running his final heat with 4 big boats! Bernard charged into the start only to find out that after three laps all the big boats were out of the race and the water was dead calm…. The replacement carb was not setup right and she was running to slow to get the 28-29 laps in that he needed. I felt really bad for Bernard, as he tried so hard. Had he stuck with the number 3 heat setup, who knows what had happened? More mishap in the final heats; Sander ran his boat into buoy #5 in lap four, launching it approx. 6 feet into the air. After the race it was towed in and the rudder standoff was torn out of the carbon reinforced hull. It took him all night to repair it. Others desperately tried to get a result in. Some succeeded, some didn’t. Our strategy paid off and we had three guys in the finals! What a result! All finals (hydro and offshore) were run on Monday. The Offshore 35 class was to run its final heat at the end of the day. Nice…. NOT! I could get nervous all day long…... I was so eager i would even have run it at 07:00 in the morning. I tried to relax a bit by listening to music and do some swimming. It worked. At the end it is only toyboats…. When we got into the “highway of hell” some final advice was slung our way; “take it easy on the first couple of laps. They go crazy and might take you out”. We took that advice and stay out of trouble before the start. At the start I was in position 4 or 5. Then it all went crazy at buoy number 1-2 -3. Where was my boat?! It disappeared in curtain of propwash and churned up wakes! I knew that I was on the outside lanes so I let go a bit of the throttle and let it drift a bit more on the outside of the course. There she was and I was still in the race! By that time the 9 other boats had slipped in underneath me and I was last coming around buoys 5 and 6. Sander was the first to blow of the water in lap 1 at buoy 3. He lost it when the hull just rolled over the wake of another boat. Mind you his Faluga is 62inches. It took 3-4 laps before I could find my rhythm back and assess the situation. I guess that is where experience does help but as I did not have any world cup finals experience I had to pace myself. Paul quickly filled me in and we had an overtake-race on our hands and the pressure was on. Lap after lap I could close gaps but everybody is fighting for position of course so it took all my wits and Paul assistance to get me through the field. Luckily some other boats went dead or blew off (Larsen, Andersson), so the field settled a bit. After overtaking boat number 6, 7 and 5, Paul was pushing me to close the distance to number three boat, Joachim Hoff from Germany. Boat number 2 Alessandro Oldini had some trouble in finding his lines (his boat was mega-fast) and missed a couple of buoys which he had to correct (is allowed by circling back on the inside of the course but you must not interfere with or hinder the other boats). Seeing a big hull like that at full bore, dart across the course is enough to make anybody nervous. Paul estimated the distance to Hoff, we were closing. There is that yellow boat again, I backed off a bit not risking it all. Paul pushed me to close the gap. Time was running out and we could not close the gap with number three boat any further… Two seconds…. After 12 minutes the end-signal was given, the race was over and we took fourth place. Looking at the scoreboard I saw Kees came in fifth! Not too shabby for two rookies I guess. Smiling faces all around and Nicklas Spar from Sweden took first place with 40 laps. As a result he was pushed in the water which has become a tradition over here. You run your but off, take first place and get wet! Finally the first three ranked boats need to have their engine-displacements measured. They do this for all classes. Anything above the allowed measurements and you are out! Number four also needs to be on standby. Everything checked out so no cheating there. Kees and his pitman Arnold Sr. were just as happy as Paul and I were. Ok, I could not (yet) compete with the top three big boats, but I came very close. We finished and made a good overall result. The award ceremony in the evening was followed by eastern-European style banquet with music, belly dancers and food and drinks all around. Norway did very well overall (taking a lot of gold and silver in the hydro and offshore), Italy and Germany also. It was nice happening and everybody agreed that this was a very well organized World Championship event. Probably the benchmark for the coming events. The second part of the worldcup we did not attend because time was running out and we did not compete in the V-classes. So we packed up and went on a two-day city trip to Budapest, the capital of Hungary (good idea from Paul’s girlfriend). We enjoyed our stay at the banks of the Danube very much visiting the major city attractions and site-seeing. Ps. I would like to thank the people who took the pictures/video, etc. making it all visible for everybody to enjoy. Pascal and Claude from France, Chriss from Germany, Kees, Petra, Paul, Adam, Jon, etc, etc. 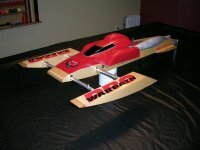 Special thanks to Marc Weijenberg for submitting this article to Modelgasboats.com!